This week the discussion topic in one of my classes was death, dying, and the grieving process. Kind of depressing, right? Death isn't something that I spend much time thinking about for that reason. 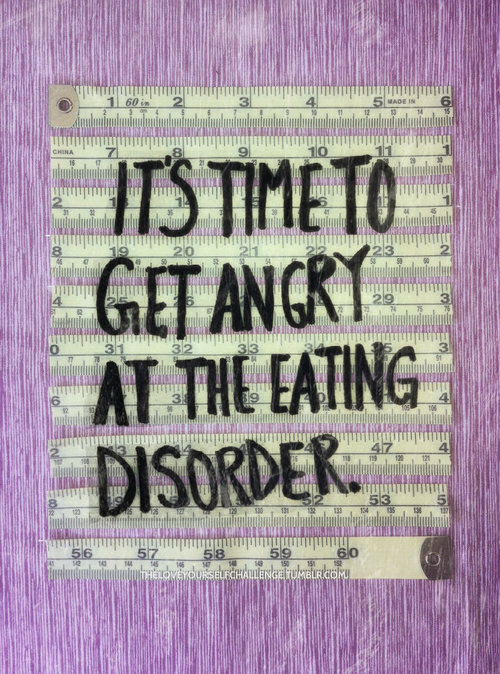 Most people don't realize eating disorders are the number one cause of death among all mental health disorders. Although there are huge consequences for remaining sick, many of us struggle to ever to get better. 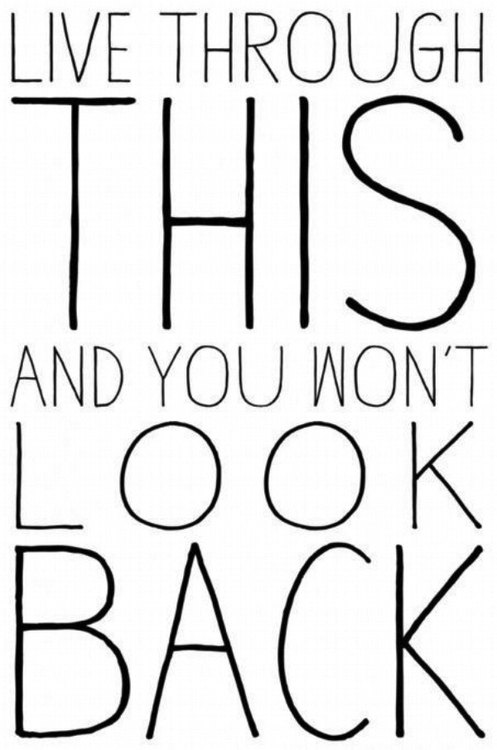 As I have gone through recovery, there has been somewhat of a grieving process that has taken place as I have let go of my old, familiar, and comfortable best friend - the eating disorder. 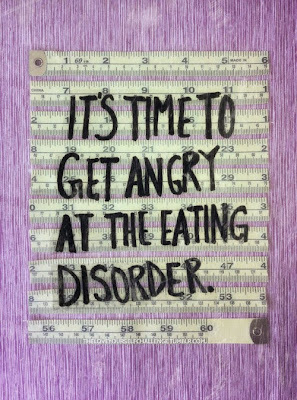 Over the years, if I was having a bad day and needed to numb out, the eating disorder was there. If I was feeling in inadequate, I would just remind myself that I was the best at restricting my food intake. In a very sick way, the ED made me special. That constant false sense of accomplishment kept me going when everything else seemed to be crumbling before me. Denial - "My eating disorder isn't THAT bad. I don't need help." Anger - "How could my parents have left me at this place (treatment). They must not love me. How can these people make me eat this food?!" Bargaining - "If I'm going to eat this much, I should be able to walk every day." Depression - "I hate this. Let me stay in bed all day. I don't know how to deal with all of these surfacing emotions." Acceptance - "There's no turning back. Recovery is the most difficult thing I will ever do, but it sure beats living with an eating disorder." "The feeling associated with giving up something loved - or at least something that is part of ourselves and familiar - is depression. Since mentally healthy human beings must grow, and since giving up or loss of the old self is an integral part of process of mental and spiritual growth, depression is a normal and basically healthy phenomenon (pg. 75)." This might explain why it often feels impossible to give up old, destructive habits. Many of us are unwilling or unable to suffer through the pain associated with giving up our eating disorders. Consequently we cling, sometimes forever, to old thinking patterns which of course keeps us sick. A few months back I did a post on the Washout Phase, where patients often feel like they have hit a brick wall in recovery and they begin to question whether or not changing is worth it. I think this depression phase of the grieving process is a huge part of the Washout Phase. The good news is, however, once I pushed through that depression phase, I had my "ah-ha" moment and realized there was no turning back. In a way, living with an eating disorder is like living with death. Although I didn't realize it at the time, I was slowly killing myself. Everyday that I spent caught up in my ED, a small part of my soul was taken away. I became emotionless, vacant, and somewhat unaware of the world around me. Nothing mattered except my rigid routine. Losing something we have grown to love is not easy and unfortunately many of us have to go through a phase of depression in order to get to the other side; however, keep in mind this part of recovery is completely normal. If you find yourself in that depression phase at this moment, remind yourself that not only is it necessary to heal, but it will also pass. Making the choice to stop living with death (my eating disorder) was one of the most difficult things I have ever done; but one year later, regardless of the pain, it is clearly the best decision I will ever make. yes yes yes! I still remember being warned I would hit this grieving stage - where I would miss that disorder, feel recovery is just too hard, and feel like it isn't worth it. but once I pushed past that, the moment happened and it was like a light was just turned on. Yes, exactly! I went through that for quite awhile too, but that moment when you realize there's no turning back make it all worth it. This is a great post, Kelsi. And I especially love the last part. I find myself often telling people to make sure they make an informed decision about whether or not to recover. I say, "OK. Well, live in solid recovery for a few years, and then tell me if you'd rather have your eating disorder back." Making that decision in the beginning stages is a cop-out. Of course people would go back because it still feels easier, and therefore safer. I agree with you. 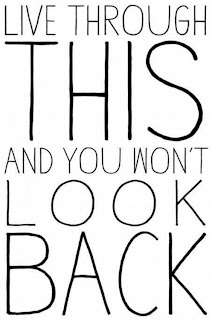 It was the best thing I ever did with my life and I have ZERO regrets :) Hugs! This makes SO much sense!! Ohmygoodness -- you've explained every one of my relapses in one post. Before, I've always hit depression and have relapsed, letting that feeling drown and overcome me. This time I pushed past it and voila!! Here I am in the land of acceptance. I think mourning is the proper thing to do, but I also think that it needs to be an open casket burial. What I mean by that is that I think we need to acknowledge the power, control and destruction that our ED really had over us. We need to look all of its evils straight in the eye and be ready to say goodbye and good riddance. We have to know that our life is FAR better than retrieving them after the burial. Or else we might as well dig our own grave right beside our dearly departed ED. (That came out a lot more dark/morbid than I hoped, but let's face it, I won't be celebrating my ED at its funeral, I'll be glad to see it dead and gone). Definitely a fabulous new perspective to bring to the table. When you spoke of depression, I thought of another story, of the prophet Elijah...in a time of fear (1 Kings 19), he ran into a desert and sat under a tree, ready to die rather than face the object of his fear. This was a great man of faith, praying to God to let him die! "I have had enough," he said. He then lay down under the tree and fell asleep. An angel touched him and said, "Get up and eat." In other words, do the first thing to start nourishing yourself again. Become strong again. It's not time to give up! Elijah ate and drank, then he lay down again. So, he ate and slept--building up strength for the next thing. The angel returned and told him again, "Get up and eat, for the journey is too much for you." He was strengthened and able to travel forty days and forty nights. His life did not end there, and his story gets even more exciting as God himself appears to Elijah, though not in the way Elijah expected. There are so many parallels to his story, I would venture to say, and any of us facing what seems insurmountable. I can testify that the hand of God is ready, willing, and more than able to give us what we need to make it through whatever that "next thing" is. Thanks so much, Alison! Your words create a very positive vibe and I can't help but smile when I finish reading your comments. I feel very lucky to have you along this journey with me. Positivity, I have found, makes a HUGE difference in the recovery process. So keep spreading your contagious uplifting spirit! I realized very quickly that i need help and that i cant continue "living" like this. But i also alway hit the depression state and relapsed, harder every time, for month and months. There was also a time where i just kind of gave up to get better i stopped caring. When my hope came back i suddenly knew THIS time there is no other option than recovery. Even though nobody said this to me, i just knew it because i was so sick of my Ed and the Depression. I gained so much life in recovery and rediscovered myself, and i start to accept who i am and the way my body is. Now a couple month later i´m struggling a little but i just see no point in beeing sickly thin anymore (its just not worth it! )so i try to deal with my struggles instead of giving up.